Chris Samnee: Silverhawks! Well, the villains anyway. Yeah, I love the Silverhawks, and I don't care who knows it! 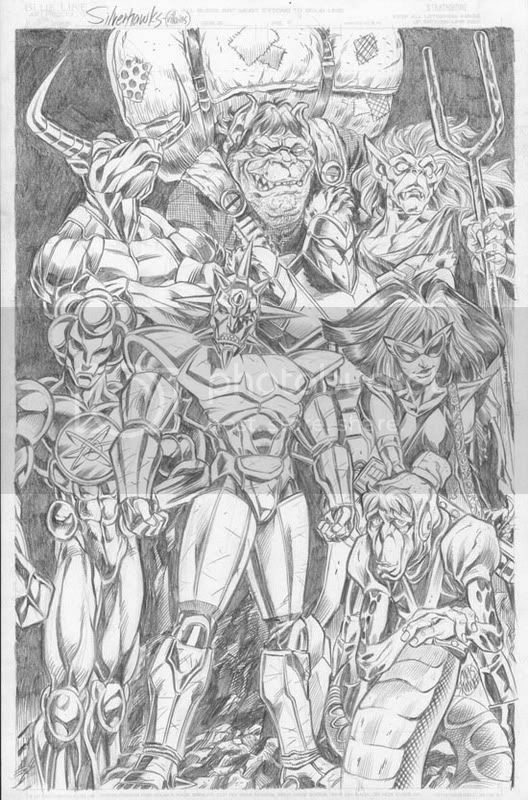 By the way, this was done around 2003 so that's why the pencils are so over rendered. There's a lot of things I'd do different if I drew this today but Mon*Star (that's the big bad in the middle) still looks pretty cool if ya ask me. That's awesome! I use to love this show. Seriously! And they still hold up if you watch 'em nowadays. Now if we can just get somebody to put it out on DVD I'll be happy. hey bro i really liked you art so much and i wanted to contact you because i want to get a tattoo of the cowboy from sylverhawks and i really liked your style to have it on my skin forever. if you are interested on doin' a design for me contact me. Thanks a bunch, Askur. I'm really glad you dig my stuff, but I just don't have the time for something like that. That just floored me. Silverhawks was and is one of my favorites and you did it justice.